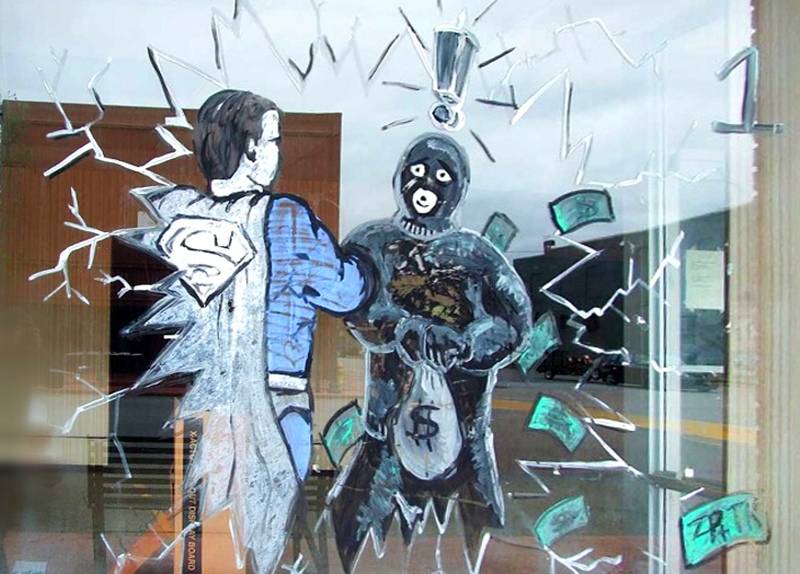 This robber is caught by Superman. Unfortunately there is no Superman in the world of low-cost airlines. I’m on my way back to Kraków from a two-week trip to the Netherlands. I’m flying there with Ryanair, the well-known Irish discount airline. Over the years I’ve taken many flights with the company, and have developed a love-hate relationship with them. On the one hand their fares are unbeatable (if you book early), and they fly some very convenient routes. On the other hand their cramped airplanes, the cattle-like treatment you get, and the hefty penalty fees for all sorts of trifles make every journey with them an ordeal. When I booked my current flight some months ago, I noticed something new. Ryanair now quotes its fares in the currency of your country of departure, regardless of whether this suits you or not. Then it ‘conveniently’ offers you the option to exchange that fare into your own home currency… at a hefty markup of around 7 percent. If you generally book return flights from your home country, you probably won’t have noticed this. But if you travel around Europe a lot, this is sure to raise your cost of travel by quite a bit. As I belong to the latter group, I’m far from happy with this policy. It’s bad enough that Ryanair forces you to buy tickets in a foreign currency, despite being Irish and using the euro for its own accounting. But I much rather let my bank do the currency conversion than accept the extortionary rates of ‘the low fares airline’. Ryanair is not alone in offering a ‘convenient currency exchange service’ at ridiculous rates. I’ve noticed this ‘exchange sharking’ practice at ATMs around the world, at some online stores, and since a few months even on freelance platform oDesk (shortly thereafter rebranded as ‘Uwork’). But here’s the catch: all those services are opt-in. The payment screen allows you to choose whether to pay in the local currency or in your own, at a clearly displayed exchange rate. Not so with Ryanair. When I made my booking there was no option anywhere in the booking process to opt-out of their automatic currency exchange. Only after I had paid, the exchange rate that had been applied to my card was shown… and it was nowhere near reasonable. To ensure that I hadn’t simply overlooked the currency conversion option on one of the screens, I scrutinized each step of the process extra carefully when I booked another ticket for my girlfriend. With the same result: Ryanair shoots first and asks questions later. Or rather, not at all. Most people probably wouldn’t have noticed what had happened. Or if they did, they would just grumble and get on with their business. Very few would actually contact Ryanair about the issue, not in the last place because of their horrendous customer service that can only be reached through a buggy web form. But I’m not most people, and I like to make a point if I feel it needs making. So I politely wrote to their customer service department, only to be told that the currency conversion was my own fault, and that I should have opted out by ticking a check box somewhere in the booking process. Yeah right! Fortunately I have the paranoid habit of taking screenshots of online transactions, and I could demonstrate that there had been no check box anywhere on the web form. Next the customer service asked me to obtain proof from my bank of the amount that had been charged to my card. There was absolutely no need for this, since they could see in their own accounting system how much they had taken from me. But they seemed happy to throw up an extra barrier to dissuade me from pursuing my stolen money. I wondered how many people would just give up at this point. 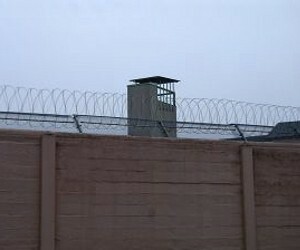 Ryanair’s customer service is about as accessible as this guard tower. But once I’m resolved to do something, I will see it through, so I decided to keep pressing the issue. I took a screenshot from my online banking history and sent it to Ryanair’s customer service (again through the cumbersome web form, as their email address is ‘unmonitored’). I also politely advised them that I’m an online marketer, and that I would happily take the opportunity to give them some extra publicity over the case–a trick that has worked wonders before. I don’t know if it was the promise of bad publicity, or simply them having run out of options to tell me off, but I finally got a letter stating that they would refund the stolen money… or not quite. The customer service rep dryly announced that they would refund EUR. 11.94, whereas the money unduly taken for currency conversion had been EUR. 14.55. How they came up with this amount is anyone’s guess. It almost felt like they were trying to see just how far they could push their luck. So altogether it had taken me a couple of hours of work to reclaim less than 12 euros that Ryanair had stolen from me. That time would have been more profitably spent elsewhere, and I imagine the same goes for most people. And that is exactly what Ryanair is counting on: that most people won’t jump through all the hoops to reclaim a tiny amount of money. But tiny amounts add up. Imagine that out of a hundred Ryanair passengers only one* books a flight from another country than their domicile (or using a credit card in another currency than that of the country of departure). That’s 817,000 passengers**, booking flights worth on average EUR. 46.40**. These passengers are overcharged by about EUR. 3.25 each***, adding up to a total of EUR. 2.65 mln. Due to Ryanair’s cumbersome customer service channel and its stonewalling policy, I imagine that no more than one out of ten* passengers manages to fully reclaim the money taken from them. That results in an extra 2.39 million euros in profits for the company, directly stolen from its customers. To put this in perspective: that is 132 annual salaries (after tax) that Ryanair pays its cabin crew (source: Become-Cabincrew.com). With the current state of affairs it doesn’t look like anything will stop Ryanair from stealing from its passengers. The effort required from each individual customer is far too large compared to the amounts stolen. (Compare this to a bank siphoning off tiny amounts of money from each of its customers’ transactions: a popular plot theme in crime movies from the early years of the internet.) The oversight on airlines in Europe is highly fragmented, with national oversight bodies only dealing with complaints regarding flights taken from their country, while companies like Ryanair operate on an international scale. Moreover, airline regulation remains highly focussed on safety, whereas financial integrity is hardly a popular theme. The only thing you can do is warn your fellow-travellers, and not take no for an answer when trying to reclaim money Ryanair has unduly taken from your credit card. And we may hope that competition in the low-cost airline segment by companies like Wizz Air and EasyJet will eventually push Ryanair to adopt more responsible business practices. * These numbers are complete guesses on my part, but fairly conservative ones at that. I invite anyone to provide me with more reliable data on this. ** These numbers are taken from Ryanair’s annual report 2014. *** Assuming Ryanair overcharges each passenger by the same percentage it did to me. Radar? Kassa? Consumentenbond? De ombudsman? Wow. Eye-opening . Made me think we should create a traveller’s union that can pursue such claims. @Amy: Good point! As far as I know, such traveller interest groups exist on the national level. It remains hard to do something against bad practices of multinational corporations, other than to just not do business with them (like the municipality of Copenhagen did). As long as you keep going for the “competitive prices” of any given product or service you submit to supporting some kind of abuse – be it moral, ethical or environmental – or a plain scam like the one presented here. That’s what you get in this free market whether you choose to see it or not. @Anna: You do have a point here, but it’s not entirely accurate. A ‘competitive price’ means getting fair value for money, not getting the worst abuse for the absolute lowest price. I believe it makes sense to encourage or force companies to accept ethical business practices, even if that raises the price a little. In Ryanair’s case, it could stop scamming its customers, pay fair wages to its employees, not treat its passengers like inmates, and still be the cheapest airline out there (though not by as large a margin). I booked two one way tickets from Europe to UK with Ryanair and was pleased with my €22.99 per ticket. With extras of “buying” a seat my total cost was €68. This was then converted after I had paid for it to £51.99 which gives me an exchange rate around £1.30. I brought Euros locally at £1.34 tourist rate!!! I do not recall being invited to pay in Sterling or Euros, I always pay in Euros and let my bank do the exchange rates. I really think they will seek any opportunity to ‘screw’ their customers! They (Ryanair) are also charging to check-in online early!! This really is scraping the bottom of the barrel? @John: Yes, they do try to leverage every opportunity to take some extra money from you. Interestingly, if you’re smart about it and never check in early, always remember to print your boarding pass, don’t buy their in-flight lottery tickets, etc., your less alert fellow-passengers are actually picking up part of the bill for your flight. Without these policies the ticket prices would probably be somewhat higher. Unfortunately there is no way around the foreign exchange scam that doesn’t involve loads of effort. yesterday I on-line booked a Manchester flight for 2 persons and payed with my VISA card. On the confirmation there is the total amount 85594.00 HUF ( 290.93 EUR ) . However my bank account was loaded by Ryanair with 92946.57 HUF (315.92 EUR) through the transaction. Is there a way to get back the difference (25 EUR) ? @Bálint: It depends on whether you ticked a box (or forgot to untick one) saying that you agree to be charged in a different currency than the one quoted when booking the flight. Ryanair always tries to charge you in the least favourable currency, with a ridiculous foreign exchange markup. There may be a small tickbox hidden somewhere between the endless list of spam pages for rental cars, hotel rooms, and insurances that you have to go through when booking a flight with them, which when left ticked means that you agree with this policy. However, I’ve scrutinised the entire booking process once when I was making a booking, and the tickbox was nowhere to be found, not even hidden between other spammy content. They still overcharged my credit card, as I described in the article. It took me three or four formal letters to their legal department with threatening language to get part of the unduly taken money returned to me. They do their best to ensure that it’s not really worth your time to reclaim the money they steal. See if there is another airline offering a similar flight at an equal or slightly higher price to avoid getting scammed. See this article to find the cheapest low-cost flight. Excellent alternatives are often offered by Wizz Air, or local low-cost carriers such as Vueling, Transavia, and Norwegian. If you have to use Ryanair, take a screenshot of every page in the booking process and download their terms of service at the time of making your booking. If overcharged, immediately file a complaint with the national aviation authority of the country from where the flight departs, asking them to investigate the matter, because you suspect that Ryanair is committing fraud on a large scale. Contact Ryanair’s customer service, saying that you disagree with the amount taken from your account, and that you demand the amount stolen from your account back. This will be refused. Keep insisting on your point by contacting them again and again. Take the least amount of effort to write each letter, but make sure that it will cost them some time (is money) to answer. Post your bad experiences with the company on any travel forum that you can find. Only if it results in enough bad publicity, extra customer service costs, and pressure from aviation authorities may Ryanair change its scammy policies for the better. I’ve just found out where the box was: you have first to click on ‘click to find out more information on our guaranteed exchange rate’ on some small text that only appears once you’ve put your credit card details on the payment page. So if you take a screenshot before entering your credit card number there will be no text, and after the text shows up but still not the box, you have then to click on the “more info” link then a pop-up opens and then at the end you have the box to UNTICK after some more text to warn you that relying on your bank’s rate ‘could result in significantly higher costs’. Before carefully checked the page and checked on the web what had happened, the previous time I paid my ticket I’ve been charged around 75.94€ for 532DKK so about 4.70€ more than the normal price so +6.2% of the market rate (which one has not changed by more than 0.5% in the last 10 years). As far as I can tell this sounds illegal to me. The danish krone is pegged to the € and cannot move by more than 2% so Ryanair is charging a illusionary rate not just a bad rate, a rate that cannot even exist in practice, not a single bank should be allowed to do that…. I’m a N26 customer that uses the mastercard mid-market rate so basically you have no hidden fee and just pay in foreign currency at the current market rate, I hope that one day all banks and services in EU should indicate clearly how much they depart from the rate of the day. It still came through on my card in GBP, at 6.7% above the rate quoted at https://www.visaeurope.com/making-payments/exchange-rates for the relevant day. This Dynamic Currency Conversion is disgraceful, but even worse when no opt-out is possible. As you write, I will let that one go as it is not worth my time – I just add 10-20% to any Ryanair quoted price before comparing to other airlines. One I will chase is that the BusinessPlus “any flight changes (date/flight/route) made before the day of travel will not be charged a flight change fee”. The service desk at LGW could not do it without charging me GBP48 (similarly converted from a EUR quoted amount) even though the flight price was less than the flight I had booked (I have screenshots taken day before and day after I made the change). For requesting a refund I avoid the frustration of their web form my using snail mail! Unlike some companies they don’t make it too difficult to find the postal address on the website. Easyjet is so much better in almost every way – I only use Ryanair if they fly a route that is more convenient for me on that occasion. @Richard: Your idea of mentally adding 10% to the quoted ticket price for all Ryanair flights is quite interesting. Flight search engines such as Skyscanner could use this. They allow you to select the currency for your comparison. As it is, they simply use the mid-market exchange rate to approximate the price in your own currency for reference. But they could go further, and use the actual conversion rate that the airline charges. That would make Ryanair tickets look significantly worse in the search engines, unless the searcher is requesting prices in the currency of the departure country. Oh, and I use mostly Wizz Air for low-cost flights across Europe these days. They are just as uncomfortable as Ryanair, but at least they are pretty transparent, with no hidden tricks up their sleeve. I was very careful to remove the exchange option. Ryanair still ripped me off. I had a gut feeling to take screenshots (I think they did that to me before). The screenshots clearly show that I opted out and did not accept their exchange, so I filed a complaint right away to them, but I can see they do their best to make sure it doesn’t worth for you to keep complaining and claim back what they stole. I think we need to do more than just file complaints. They calculated with that for this scam. The few who file complaints they bounce back, and a very few very persistent ones they might refund at the end, but the scam brings them so much more, and I think they get satisfaction out of you having to work for your money back much more than what it actually worth. I think we need to do screen recordings when purchasing tickets from them, post the scam all over Youtube and social media, and tell people to file complaints, do their recordings, and do whatever they can. If the only thing achieved is to get a lot more people filing complaints, that will already make the scam less worthwhile.